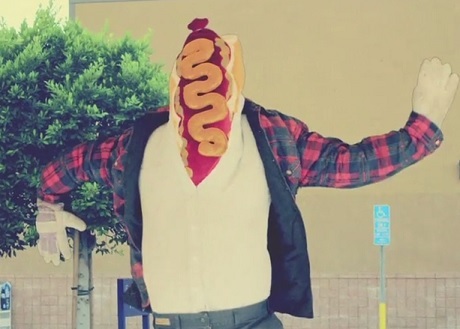 Sacramento rock explorers Tera Melos recruited a legitimate meathead to star in yet another weirdo video supporting their X'ed Out LP, with the hot dogger showing off his arsenal of dance moves to the tune of "Sunburn." As the blur of polyrhythmic guitar leads, down-soft vocals and alt-rock era melodies play in the background, we find our mustard-and-plaid-clad hero hopping into his automobile to meet up with his friend, a holographic head projected out of a can of Doritos-sponsored soda. Also observed are a dangerous road course littered with body parts, a porcine-infused dream and a wiggly dance-off. You'll find the protein-packed boogie-a-thon down below. As previously reported, Tera Melos are about to hit the road with Pinback, and will make their way to Vancouver by the end of the month. You'll find the show specifics here.